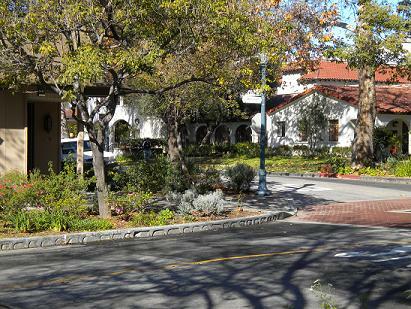 The episode was filmed in downtown Claremont! Going above and beyond, MacLaughlan-Dumes e-mailed screen shots of various freeze-framed images that showed recognizable Village landmarks. For the sake of comparison, I took photos in the same locations 44 years later. The photos are paired below (to the best of my sizing ability), reading left to right. Click on any photo to see a larger version. 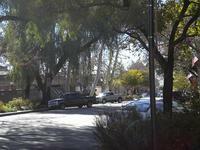 1) The first two are on Harvard Avenue looking south from Bonita. At least mine is; I think that’s where the original is oriented. I declined to stand in the middle of the intersection for my photo. 2) These two are shot from the SE corner of Harvard and 2nd. My version depicts today’s Boon Companion toy store (SW corner, to the left in photo) and City Hall (NE corner). What was on the SW corner in 1966? 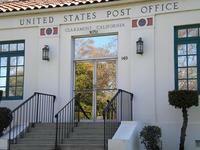 3) Speaking of the SE corner of Harvard and 2nd, that’s the lovely Post Office. If you’ve never been inside, go in and look at the Milford Zornes mural that wraps around the lobby. 4) This is the sidewalk looking north from in front of the Post Office toward Shelton Park on the NE corner. David Janssen (1931-1980) was unavailable, but a Claremont fixture, the little old lady, wandered into the frame. 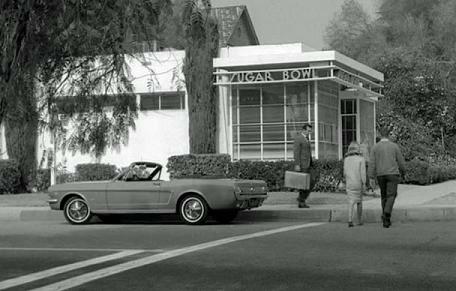 5) The NW corner of Harvard and Bonita had the Sugar Bowl, a soda fountain and candy store. Today it’s Unique Jewelry and Gifts. And here’s an interior of the Sugar Bowl, unduplicatable today. Anyone seen this episode, remember the filming or want to reflect on any of these places? Interesting piece. I think there was a men’s clothing store on the sw corner of 2nd and Harvard before the toy store. You might be interested in talking to Laura Bollinger. 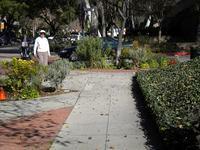 She has presented a program to several groups in Claremont with a series of movies and TV shows filmed in Claremont. 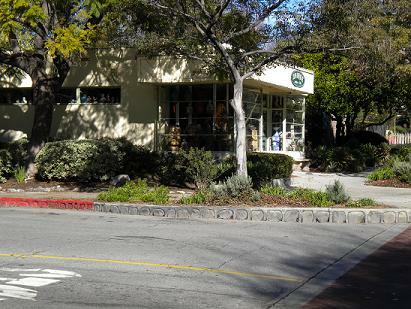 The Sugar Bowl turned into Claremont’s first organic food-and-whatnot store around 1968-1969, run by a Mrs. Zavidowsky. Where the Boon Companion is today, my not-always-perfect memory recalls Spaghetti Village, a restaurant, and later a men’s clothing store. Great post! I was unaware of this I guess because I was away for my freshman year of college when it happened. I’d love to see Ms. Bollinger’s presentation too. The mens store referred to was The Rack. The Sugar Bowl history would make for an excellent column or blog post, if it’s available anywhere. It was run by a very eccentric, exotic older woman (my recollection is that of a gypsy or something) and always seemed mysterious when I was a kid. 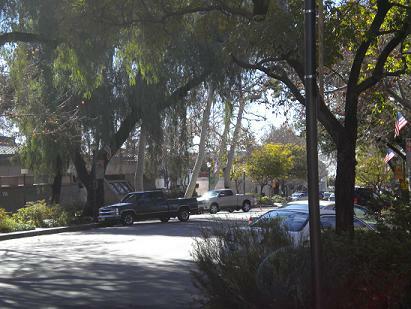 You made a previous post a year or so ago (in response to a question from “Tad”) about downtown Claremont that had some photos that appeared to be about the same vintage (1966). David Janssen was a resident of McKinley Home for Boys in San Dimas. We even have a tree planted there in his memorial with a plaque. The 1966 business on the SW corner of Harvard and Second is the Spaghetti Village (Italian restaurant). Notice the addition to City Hall building in updated photo. 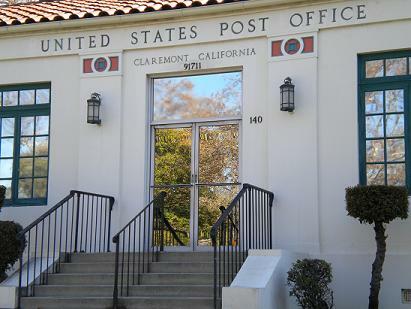 The Claremont Police and Fire departments were all in the same circa 1929 building. 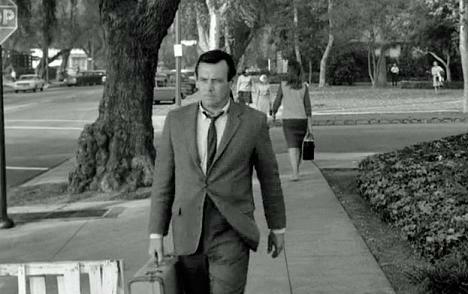 his suitcase near the Mustang convertible. Mina painted the cash register gold and there was an old piano that Pete Fullerton (famous from 1965 Claremont band the We Five) would play for hours. The piano would be about where the interior picture was taken. 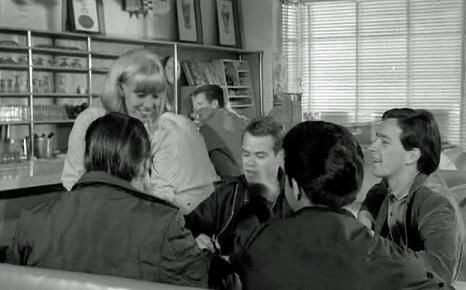 It was kind of a beatnik place without the beatniks. Mina only wore black and usually had her head wrapped in a black scarf. The other Fugitive episodes I watched after school at El Roble were filmed near the citrus packing houses and Sante Fe train depot, now Metrolink. Roz Zavidowsky opened the health food store in the Sugar Bowl building after it closed. She had not only vitamins, but fresh organic local produce, sandwiches full of sprouts and fresh organic juices made in the store. I wonder if the episode was explicitly set in Claremont, or if it was Anytown, USA? Anytown would make sense because the Fugitive wandered all over the US in his quest to escape justice for his evil crime (just joking! I know he was innocent! ), and they naturally couldn’t film the show all over the US. So Southern California would fill in for wherever. But how cool if he actually went to Claremont! I bet it was harder to leave than usual at the end as the strong-if-slightly-misguided arm of the law came closing in. When the Sugar Bowl, it seemed the place was closed for the summer or other long stretches of time. Although when I made it in once sometime in the mid-60s, how could I help not notice the wall opposite the entry door was painted with a huge mural duplicating Hokusai’s “Wave”. As a student at Sycamore School (five blocks up town from here) from 1967 to 1974, my friends and I used to go to the Sugar Bowl to buy bubble gum trading cards. Some may remember these… called “Odd Rods”, depicting crazy monster characters driving hot rods on peel-off stickers. They were a popular thing for us then, in the early ’70s.